Installing new power steering fluid filter. See Chapter 1, ?Servicing the W126 300SD, Part I.? Lower timing chain run in M117 V-8 engine. See Chapter 2, ?Timing is Everything.? 280SL throttle linkage. See Chapter 3, ?How to Adjust Mechanical Fuel-Injection Systems for Maximum Power.? 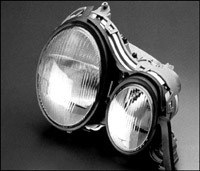 W210 E-Class headlight assembly. See Chapter 4, ?Light Fantastic.? Restoring crimp on secondary shaft of odometer. 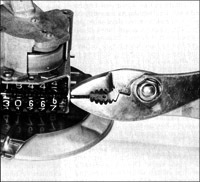 See Chapter 5, ?Repairing a Stalled Odometer.? Installing Bilstein lower hub into suspension arm. See Chapter 6, ?Replacing W210 E-Class Front Shocks.? 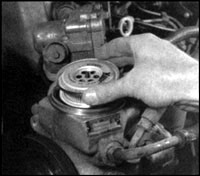 Mid-1950s brake master cylinder used with drum brakes. See Chapter 7, ?Bleeding and Fluid.? 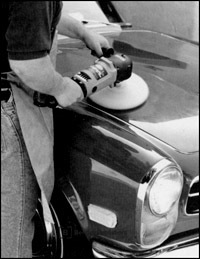 Polishing with a fine cleaner to remove paint scratches. See Chapter 9, ?How To Wax Your Car Like the Pros. ?